This beautiful boy was found as a stray. He is a little nervous being in the cattery, but is already growing in confidence and if you go slowly he does like a gentle fuss. 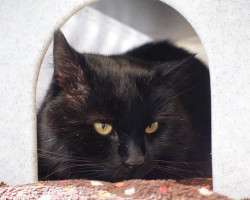 Lexy is looking for a quiet, calm home where he can continue to gain in confidence and become a loving member of the family. If you would like to meet Lexy then please do pay us a visit. Thank you!